Whenever possible, we program our parts on several different machines so they can all be run simultaneously to shorten overall cycle times and give us redundancy of resources. With our Okuma dual spindle lathe and Autodesk HSM we are able to automate parts that have several operations. The programming and setup time are intense but the result is a part that can run in a fraction of the time with very little human interaction. In this example, we took a part that required several hours of total human attention to a 45 minute unmanned operation. Here is the Inventor drawing of the part. It's a small brass adapter with different threads on either end. Moving from CAD to CAM seamlessly is the key to our engineering process. If we change a size in the 3D model the tool path will automatically update. Below is a screenshot of the HSM programming for this part. Like our previous gang-tool setup this turning strategy uses Iscar's latest technology Pentacut. The Iscar pentacut uses a 5 sided insert. The insert is a strong design put into a rigid holder and has a chip forming profile which makes for accurate parts and a great finish. The video below is a run through of the cycle. What the video doesn't show is that the main spindle will bar feed the secondary spindle so we can run a longer bar without interruption. Below is the finished part ready to ship! We have a commitment to staying at the leading edge of manufacturing technology. Our newest addition is at the forefront of CNC turning. The Okuma Genos 300-MW is a full CNC lathe with tool changing, live tooling for milling, and a second spindle to finish the backside of a part all in one operation. Here is a view inside the machine. On the left is the main 10" spindle, center is the tool turret, and the right is a 7" sub-spindle. The 2nd day into training and we are already getting good parts off! These parts previously would have required a flip in a conventional machine to finish the backside edge. Now the operator can open the door to a finished part. Relating to our previous post about Lathe cost reduction, here is a view into the world of how we transfer our raw material into finished product. The first step when a work order is posted to the shop floor is to log into our Inventory system and find the correct raw material to use. This computer screen is one terminal that runs a mobile app that we've created. The App can be viewed on any device and is 100% cloud based. The Inventory tag matches up to the record found in the App. The material is loaded into one of our saws. Here is the back-end of our Hydmech S23-A band saw. The "-A" in the saw model number denotes it's fully automatic feeding capability. A very underrated piece of our equipment is our S-23A band saw. This machine can automatically cut to length round bar, flat bar, tube, and pipe by entering in the length and quantity required. This video is cutting 4" sch40 aluminum pipe to length. Presto, finished parts come out the other end! Not really. Once the raw material processing is complete, many different part routings can take place such as these parts that have been through the saw and lathe. In Machining, a Lathe that changes tools is great but on small parts that have several quick operations there can be more tool change time than spindle-on machining time. A great way to increase spindle-on time and reduce overall cycle time is to tie several tools together in a method known as "gang tooling." Gang tooling planning is very difficult as you need to anticipate the following operations while working on the current one. At Lean Machine, we always go further than most with 3D design because it always pays off in the long run. Since we already have our machines 3D modelled and we can download all tooling off our vendor's website, and every part is drawn in 3D, we can plan out a gang tool very quickly. The Brass bar hex stock is seen with the finished machined part just needing a part-off operation. The orange block is the gang tool holder that we've designed. You can also see the blue and grey Iscar tools and yellow inserts. Here is the Autodesk Inventor designed tool block with the HSM tool paths applied. 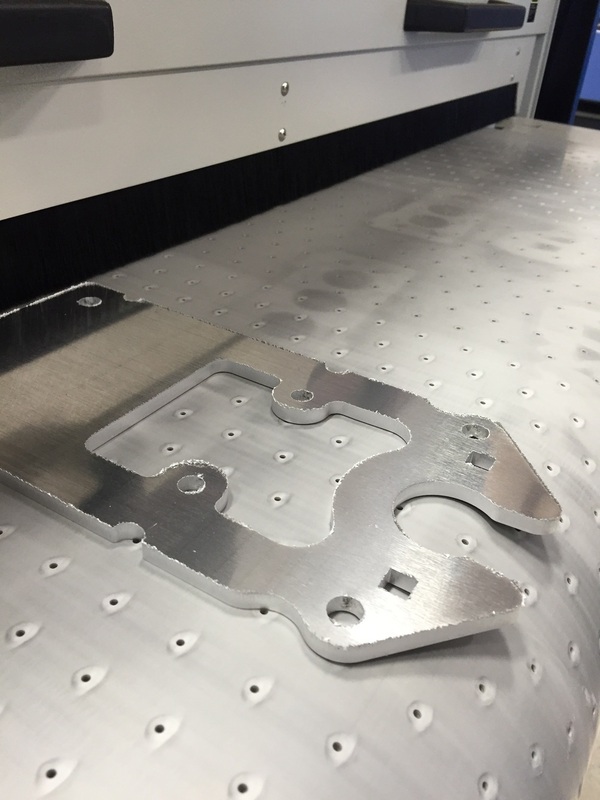 Our Haas VF4 milling the tool block. This is a steel 3"x3" billet. Iscar's endmills are the greatest! Lots of internal features to machine but we've designed to be quick to machine. Here's a close-up of the Iscar tools that will be installed in the block. All tools installed and ready to machine. Top view of the block and tools. Notice the dovetail cut on the backside to fit our tool post and the height setting attachment. Here is a great example of a steel welded assembly at Lean Machine. It's a steel ring with a strengthening rib welded on. As the demand for this part has increased we've applied our standard thinking: if an employee is going to do the same repetitive task over and over (and most likely get extremely tired of doing so) then we need to find a better way to accomplish the task. Our Motoman/Fronius robotic welding cell is always happy to help us automate. Step 1- Design and build a jig assembly that can make part placement repetitive and accurate. 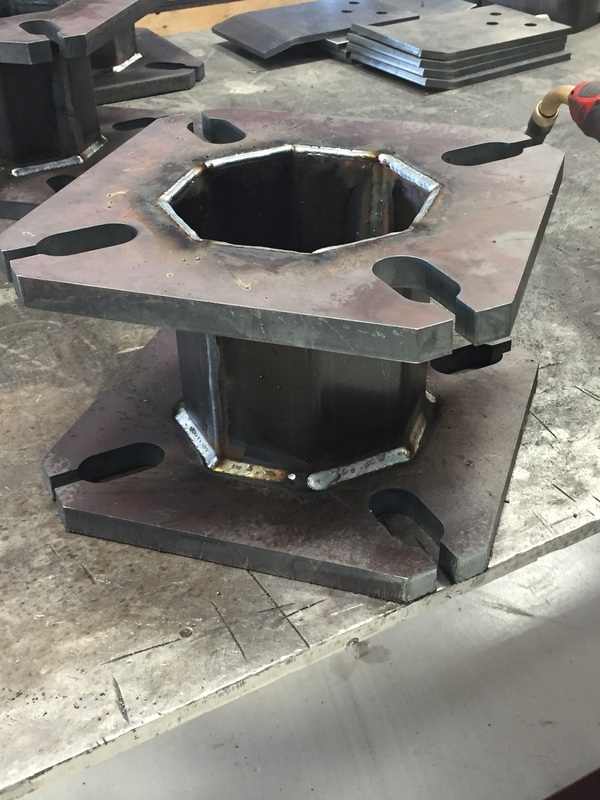 We've used the Motoman positioner in conjunction with the robot to help keep weld angles consistent. Consistent weld angles give us good flux gas (CO2/Argon mix) coverage to make sure welds are not contaminated with atmospheric impurities. Step 2 - Make the parts themselves better to help with the whole process. Here you can see slots in the ring so the rib can index itself with tabs. On the surface, these parts would be much cheaper to produce out of steel flat-bar but we've decided to laser cut them so we can tightly control tolerances on hole sizes and add trick tab and slot features. Step 3 - Write a really great robotic welding program in RobotMaster. Step 4 - Run off parts as quickly as possible! The resulting weld bead has a good start, nice bead size, proper penetration, and a great crater fill. With all of the parameters available in the Fronius welders you can "tune out" and splatter so the parts need zero clean-up after the weld process and zero anti-splatter coating. Laser cut, bent, and welded steel parts to be light post adapters for civic utility use. Nothing much to say about this photo other than it's an arty photo of our Fronius welding equipment and one of our super skilled welders. Below is a video of the part being welded. In the middle of the weld you'll notice there is almost no noise and no spatter which is a great thing! This means that the program we have for the welder to weld 10g plate to 3/4" plate is almost perfect. Our new de-buring machine has arrived! This machine takes flat parts that are cut on other machines and breaks the sharp edge. It can also get rid of slag or burrs that are produced during the cutting process. 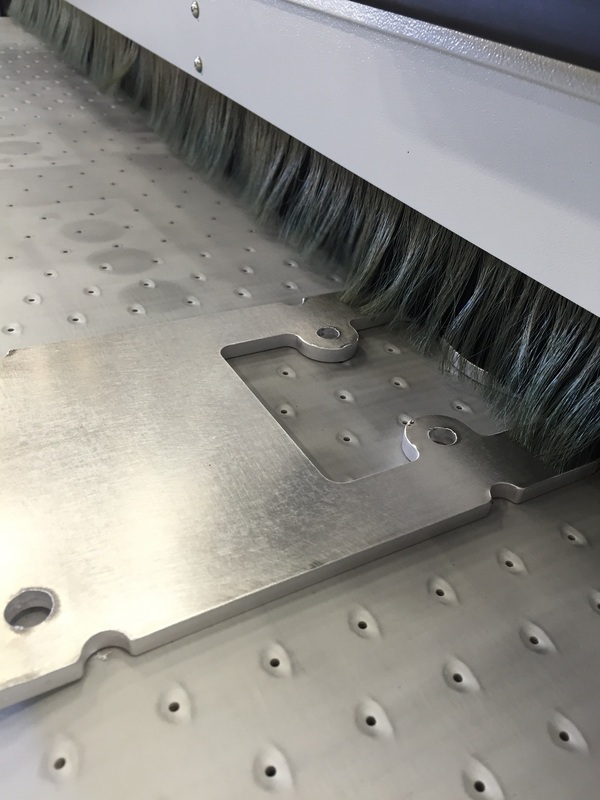 The machine can also refinish the surface of the material to give it a brushed finish. Here is an overall view of the machine from HK Laser & Systems. Even though Lean Machine's official color is red, we are starting to get a lot of blue in the shop! Here inside the machine you can see that large brushes spin and the entire assembly rotates depending on the setting you choose for grain direction, etc. 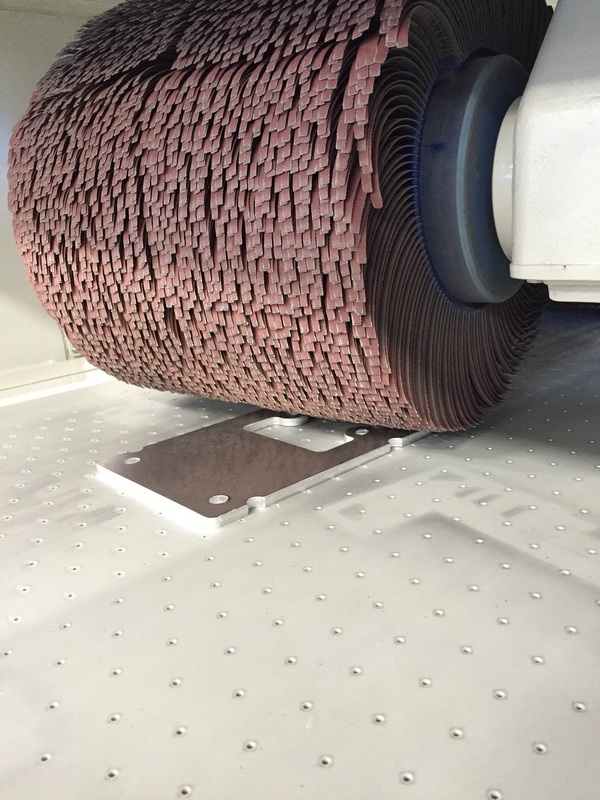 Here is an aluminum laser cut part about to be fed into the machine. Laser cutting aluminum usually leaves a burr all of the way around the cut edges. A part such as this could take someone approximately 2 minutes to debur properly. The small holes you see in the conveyor are actually vacuum ports which help to hold the part in place while the brushes do their work. Here is a view of the brushes about to do their work on the part! The shape of the "fingers" on the brushes makes sure that the inside of every hole and cutout are well looked after. The finished part exiting the machine is completely free of burrs and sharp edges. You'll also notice the large surface of the part has received a slight brushed finish which helps eliminate small scratches on the surface of the part.